Like many of you, I've spent a lot of time this week watching and reading coverage of the earthquake, tsunami, and subsequent nuclear crisis in Japan. The news coverage I've seen of the earthquake and tsunami has been heart-wrenching, and I strongly encourage all of you to give generously to reputable relief charities. However, the news coverage of the unfolding crisis at Japan's Fukushima Daiichi nuclear power plant has been, through most of what I've seen, poorly done. Two days ago I spent an agonizing 15 minutes watching a national news anchor and a meteorologist discussing what impact the wind might have on radiation levels in Japan. Both people freely admitted to not understanding why the wind would have an impact, or even where nuclear radiation comes from. Yet rather than bring on an expert who could explain these important issues, they admitted their ignorance and threw it to commercial. News coverage like this leads to fear and panic, and fails to provide that one crucial item that the field of journalism is built upon: correct information. So today there are reports of panic purchasing of radiation-related health products on the West Coast of the U.S. when, to the best I've heard, there has not yet been a catastrophic release of radiation from the Fukushima Daiichi plant, and if there were, it would be many days before any radiation could reach the U.S. Radiation leaks are scary. We need special equipment to detect radiation, so unlike many threats, the public can't see it coming. We have to rely on people "in the know" to be honest with us. And, in the worst radiation accident that we know of, the explosion at Chernobyl, those people tried to cover up the accident. What we as the public need is sound journalism with expert scientific reporting to help us to understand what is happening at nuclear plants in Japan. We don't need anchors wildly speculating about radiation and constant reports on fear and panic. Perhaps major news organizations will rethink their attitudes toward science journalism – there should be more effort involved than incorrectly regurgitating a story from a marginally-reputable news outlet. http://ansnuclearcafe.org/ - A blog from the American Nuclear Society, compiling information from several different sources. http://mitnse.com/ - the MIT Nuclear Science and Engineering Nuclear Information Hub, maintained by students at MIT's department of nuclear science and engineering. As in any crisis, the situation is fluid, could change rapidly, and is subject to interpretation. From all that I can tell right now, there is no need for panic. Fear is a natural response, but those of us outside of the immediate area surrounding the reactor are not in immediate danger. Be concerned. Stay informed. Don't panic. 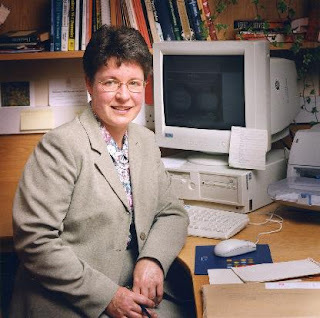 This week, our department was honored to host a visit by Professor Jocelyn Bell Burnell. Dr. Burnell is most famous as having discovered pulsars while a graduate student at Cambridge University. Her thesis work involved building a radio telescope (radio astronomy was still a young field at the time) and searching the sky for radio sources. She discovered multiple sources that emitted strong pulses of radio waves every second or so. These sources turned out to be neutron stars, or stars with the mass of the sun squeezed in to a ball about 10 miles across. Neutron stars are the remnants of many stars that end their lives as supernova explosions. The discovery of neutron stars revolutionized our understanding of how stars live and die. You can read her own description of her discovery here. Dr. Burnell's thesis advisor was awarded a share of the Nobel prize for this discovery, but Dr. Burnell did not receive that recognition. Her contributions to this discovery have been well-recognized and rewarded since, and Dr. Burnell has had a long and fruitful career in astrophysics. Dr. Burnell visited our department through the efforts of one of our postdoctoral researchers, Will Newton. Dr. Newton came to know Dr. Burnell while he was studying at Oxford. When Dr. Newton learned that Dr. Burnell would be in the United States this spring, he was able to convince our department to invite and host Dr. Burnell for a week. During this week, Dr. Burnell delivered several talks, including a talk on poetry and astronomy, a talk on the astronomical evidence against various "end of the world in 2012" hype, and a research talk on neutron stars. She also spoke with many of our classes, including a question-and-answer session with my introductory astrophysics class. The students seemed really enthusiastic to have her visit, and they asked some great questions. I was very happy. I hope that some of the benefits of Dr. Burnell's visit will be more than memories of a visit by a great astronomer. First, I hope that many of the students saw, consciously or unconsciously, that women scientists arre absolute equals in research and teaching ability. Our department is male-dominated, and a very large fraction of our regular visitors to the department are male. I and many of my colleagues and I would like to see this change, and I think that having a visitor with the stature of Dr. Burnell is a big step in the right direction. Second, I was glad that my students heard Dr. Burnell talk at length about the discovery of pulsars. While the end result, a new class of star, was tremendously important and transformative to the science, this discovery was much more involved than simply seeing a repeating blip on a piece of paper and then dancing around while popping champagne. The efforts that Dr. Burnell and her advisor, Dr. Anthony Hewish. went through to prove that they were seeing some new class of astronomical object are a classic example of how new discoveries should be made. They tested their equipment, they considered every possible existing explanation, they made multiple observations, and they finally found a second (and then third and fourth) radio source that was similar, but different enough to prove that these must be different sources of radio waves. Then they considered the most likely sources of those radio waves and wrote a journal article announcing their discovery, observations, and possible explanations. Other scientists were then able to duplicate their observations and expand upon them. We all-too-often present scientific discoveries as a "Eureka!" moment, where finally there is understanding and it all makes sense. But good science doesn't work that way. Certainly, there are flashes of inspiration, and luck plays an important role. Yet the discovery of pulsars was a months-long process involving multiple people tracking down multiple possibilities, not an instant of seeing a blip on a radio telescope. Seeing some odd blips on radio data started the process of discovery. We are very grateful that Dr. Burnell took the time to visit our university. I was pleased to have a good talk about white dwarfs and my research with her, as well as to learn a lot about neutron stars and the present state of various radio and gravitational wave observatories. I even heard some inside anecdotes about the International Astronomical Union's decision on the status of Pluto (maybe I'll write about that another day).